Labor Day is right around the corner and we know that everyone is already making their plans for the long weekend. Here at Bottiglia, we love Labor Day and getting to have an extra day to relax, unwind and have a little fun as summer comes to a close. This is why this year we are planning a special Labor Day event to celebrate the long weekend and we hope you will join us in all of the fun! 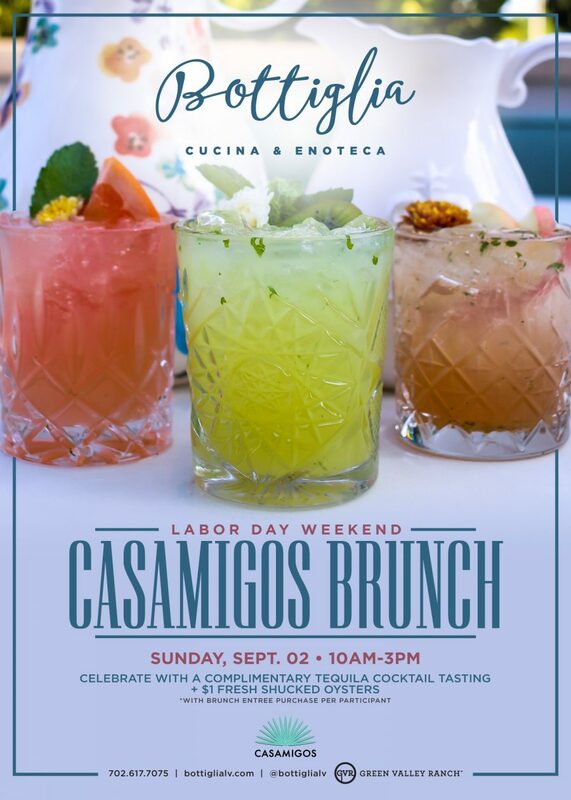 On Sunday, September 2nd, starting at 10:00 AM we will be hosting our Casamigos Brunch event. This is unlike any other brunch you’ve been to before and we promise it is about to be one of the most fun brunches you ever attend. Here’s what you can expect. We are going to be hosting a complimentary tequila cocktail tasting during our brunch which runs from 10:00 AM to 3:00 PM. Our bartenders are going to be whipping up some amazing Casamigos cocktails for you to try and trust us you don’t want to miss them. We will also be offering $1 fresh shucked oysters all brunch long. All you have to do is to purchase one delicious brunch entrée to enjoy these specials. Of course, we will be having our normal brunch menu all morning long, which is filled with great breakfast items like French Toast and Lobster Benedict as well as some of our best lunch items like our Chicken Panini and our chopped salad. No matter what brunch entrée you choose, you will be able to enjoy these great specials as part of your meal. The oyster and Casamgios tasting specials only last from 10:00 AM to 3:00 PM on Sunday, so make sure to get there right when brunch starts to take advantage of all that this brunch deal has to offer. Labor Day is coming up so make your plans now to come into Bottiglia on Sunday, September 2nd for our fun brunch event. We will have plenty of tequila available for you to enjoy, and with no work on Monday, there is no better time to treat yourself to a real Sunday Funday this Labor Day weekend!